My desk is a bit (?) of a mess this week as once more I have a few things going on, and, don't fall over with surprise, one of them is almost finished. It's like a crafting version of I-Spy, something beginning with 'A' - Altered book. Something beginning with 'B' - button (extra points if you spot this one - clue: it's purple). Something beginning with 'C' - cup, 'D' - doll.....'F' - felt etc, etc. Also two cutters, the folder with all my altered book ephemera - at the back left - baby wipes, fabric and a bit of general mess. Now I've said before (and I truly mean it) I'm a crafter, not an artist but yesterday, while it was pouring with rain outside I tried to create a bit of sunshine in my Altered book painting daisies freehand with acrylic paints, all done without the aid of a safety net, no drawing, just me, a paintbrush, an acrylic block and some cheap acrylic paints. Now it isn't perfect and the budding daisies must be on MiracleGrow (plant food) but I loved doing it and am pleased with how it turned out. I didn't paint the bees, that would be a step too far for me, the two small ones are laser cuts from a sheet by Rahyer that has been tucked at the back of the drawer. I think it needs something at the top left, any ideas? 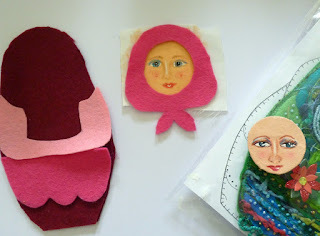 The other project I'm doing is to have a go at making my own Russian doll from the pattern Judy sent me (see last week's WOYWW for a closer look at her fabulous doll. Judy paints the faces and sent me a couple to use in mine but I decided I would have a try using one of her's as a model. Judy's is on the right and my version is wrapped in her shawl ready for sewing up. Not sure how I'm finishing her as I need to fish out beads and fibres to decorate the dress but I think now I have noticed the purple button that will go on somewhere. That's it for this week. I managed a lot of desks last week but as I have a friend coming round this afternoon for a bit of crafting fun I'm not sure how many I'll get to today but I'll try my best to visit you via Julia's Blog frenzy. 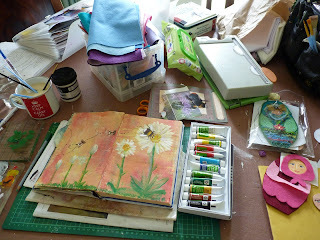 A fab, busy desk with lots of fab projects going on Ann :) I love your AB, those daisies and the bee are just gorgeous! The weather here has been rather cold and wet too, roll on the Summer and hopefully some sunny, warm weather!! cornflower photo is purple well I think it is a cornflower and as always your work is beautiufl, you are such a tallented painter. 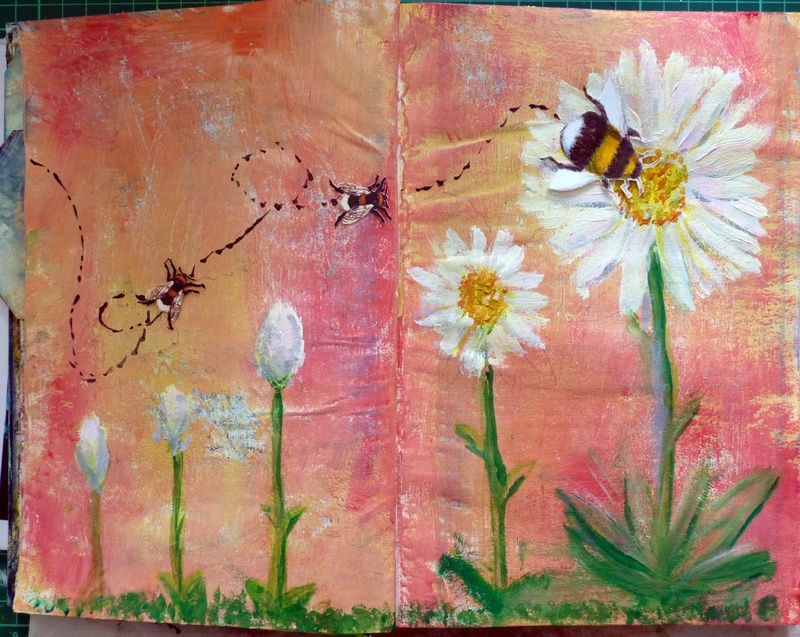 I love your page Ann and your daisies are perfect. What a bout a nice swirly sentiment stamped in that corner? Or a bit of sunshine? Don't forget the date we have next Wednesday - I will be in touch regarding the time and just where. Do hope you come. Have a creative week and happy WOYWWing... Sarah at 12. Hi Ann. What a treat your blog is. There is always something different to see. I had the opportunity of looking through your blog the other night. What a talented lady you are. Tfs all of your wonderful projects. Great looking spread and I love the idea of it! Ah Anne, but it takes me 3 days to get around, so not really much frenzy here!! Am loving the russian doly - the faces are amazing huh - and I'm the lucky recipient of one of Judy's..my word they're rich. I love your daisies, especially from bud to bloom, lovely idea and they look perfect to me. Well done you for not getting the safety net out first! Hi Ann, I am thrilled that you are having a go at the Babushka dolls and their faces!I think your is fab considering you a new to doing them.Bravo You!!! Can I put up a link to this post? I spy with my little eye a square purple button to the left of your matrioshka. Your lovely pages just need a quote or some letters/writing. Your painted face is really good too so don't put yourself down.... you are an artist as well as a crafters. Oh those faces are BOTH just fab. So tiny. I've seen a photoshop brush set that is anime faces that might also serve as a pattern. I'll have to hunt it up - if I find it, I'll email it along. I love the painting as it is! I like the space in the top left corner. You can feel the freedom and enjoyment that you had when you created it :) Good job with the doll's face too - Judy's dolls are incredible, all that detail. Yours will be fab too! Beautiful painting Ann, great colours. How about a sun in the corner or some stamped text? I spotted the purple button straight off, but I liked the analogy! Oh I love your journal page! Acrylics are fun to work with. I love how the daisy blooms and grows. Very clever. The felt Russian doll looks like fun too. Your face looks very pretty. The nesting doll looks very sweet and will look even more so when you jazz her up with your purple button and some beads. You did awesome painting your daisy. For the upper left corner, perhaps some quote about sunny days, spring, nature, or even bees. Happy day! Thank you for becoming a new follower on my blog:) I think you did an amazing job on the doll face and the journal work is lovely. Your page looks lovely! How about "Bee Happy" on the top left? You have lots going on this week. Those daisies are gorgeous. It's lovely just to play for no reason but just to be creative isn't it. I'd put some swirls in that corner, but that's just me!! I love your freehand-painting! It´s lovely. And the Russian doll is awesome. The painting looks fine to me. Loving the Russian doll.